The Illinois General Assembly (IGA) is the bicameral legislature of the U.S. state of Illinois and comprises the Illinois House of Representatives and the Illinois Senate. The General Assembly was created by the first state constitution adopted in 1818. The State Senate has 59 members while the House has 118 members, all elected from single-member districts. A Senate district is formed by combining two adjacent House districts. The current General Assembly is Illinois's 100th. The General Assembly meets in the Illinois State Capitol in Springfield, Illinois. Its session laws are generally adopted by majority vote in both houses, and upon gaining the assent of the Governor of Illinois. They are published in the official Laws of Illinois. The Illinois General Assembly was created by the first state constitution adopted in 1818. Initially, the state did not have organized political parties, but the Democratic and Whig parties began to form in the 1830s. Future U.S. President Abraham Lincoln successfully campaigned as a member of the Whig Party to serve in the General Assembly in 1834. He served four successive terms in the Illinois House of Representatives, supporting expanded suffrage and economic development. The Illinois Republican Party was organized at a conference held in Major's Hall in Bloomington, Illinois on May 29, 1856. Its founding members came from the former Whig Party in Illinois after its members joined with several powerful local political factions including, notably, the Independent Democrat movement of Chicago that helped elect James Hutchinson Woodworth as mayor in 1848. During the election of 1860 in which Lincoln was elected president, Illinois also elected a Republican governor and legislature, but the trials of war helped return the state legislature to the Democrats in 1861. The Democratic-led legislature investigated the state's war expenditures and the treatment of Illinois troops, but with little political gain. They also worked to frame a new state constitution that gave the southern portion of the state increased representation and included provisions to discourage banking and the circulation of paper currency. Voters rejected each of the constitution's provisions, except the bans on black settlement, voting and office holding. The Democratic Party came to represent skepticism in the war effort, until Illinois' Democratic leader Stephen A. Douglas changed his stance and pledged his full support to Lincoln. The Democratic Party swept the 1862 election. They passed resolutions denouncing the federal government's conduct of the war and urging an immediate armistice and peace convention in the Illinois House of Representatives, leading the Republican governor to suspend the legislature for the first time in the state's history. In 1864, Republicans swept the state legislature and at the time of Lincoln's assassination, Illinois stood as a solidly Republican state. In 1922, Lottie Holman O'Neill was elected to the Illinois House of Representatives, becoming the first woman to serve in the Illinois General Assembly. From 1870 to 1980, the state was divided into 59 legislative districts, each of which elected one senator and three representatives. The representatives were elected by cumulative voting, in which a voter had three votes that could be distributed to either one, two, or three candidates. This system was abolished with the Cutback Amendment in 1980. Since then, the House has been elected from 118 single-member districts formed by dividing the 59 Senate districts in half. Each senator is "associated" with two representatives. Barack Obama was elected to the Illinois Senate in 1996. He served in the Senate until 2004 when he was elected to the United States Senate. In 2002, a Democrat won a gubernatorial election for the first time since 1972. Members of the House of Representatives are elected to a two-year term without term limits. Members of the Illinois Senate serve two four-year terms and one two-year term each decade. This ensures that Senate elections reflect changes made when the General Assembly is redistricted following each United States Census. To prevent complete turnovers in membership (except after an intervening Census), not all Senators are elected simultaneously. The term cycles for the Senate are staggered, with the placement of the two-year term varying from one district to another. Each district's terms are defined as 2-4-4, 4-2-4, or 4-4-2. Like House members, Senators are elected without term limits. The officers of the General Assembly are elected at the beginning of each even number year. Representatives of the House elect from its membership a Speaker and Speaker pro tempore, drawn from the majority party in the chamber. The Illinois Secretary of State convenes and supervises the opening House session and leadership vote. State senators elect from the chamber a President of the Senate, convened and under the supervision of the governor. Since the adoption of the current Illinois Constitution in 1970, the Lieutenant Governor of Illinois does not serve in any legislative capacity as Senate President, and has had its office's powers transferred to other capacities. The Illinois Auditor General is a legislative officer appointed by the General Assembly that reviews all state spending for legality. The General Assembly's first official working day is the second Monday of January each year, with the Secretary of State convening the House, and the governor convening the Senate. In order to serve as a member in either chamber of the General Assembly, a person must be a U.S. citizen, at least 21 years of age, and for the two years preceding his election or appointment a resident of the district which they represent. In the general election following a redistricting, a candidate for any chamber of the General Assembly may be elected from any district which contains a part of the district in which he or she resided at the time of the redistricting and reelected if a resident of the new district he represents for 18 months prior to reelection. Members of the General Assembly may not hold other public offices or receive appointments by the governor, and their salaries may not be increased during their tenure. The General Assembly has the power to override gubernatorial vetoes through a three-fifths majority vote in each chamber. The governor has different types of veto like a full veto and a reduction veto. If the governor decides that the bill needs changes, he will ask for an amendatory veto. ^ "Illinois Legal Research Guide". University of Chicago Library. Retrieved 5 September 2013. ^ White, Jr., Ronald C. (2009). A. Lincoln: A Biography. Random House, Inc. ISBN 978-1-4000-6499-1, p. 59. ^ "Lottie Holman O'Neill (1878-1967)". National Women's History Museum. Archived from the original on September 6, 2015. Retrieved December 1, 2015. ^ Scott, Janny (2007-07-30). "In Illinois, Obama Proved Pragmatic and Shrewd". The New York Times. ISSN 0362-4331. Retrieved 2017-10-04. ^ root. "Illinois : Past Governors Bios". www.nga.org. Retrieved 2017-10-04. ^ Uphoff, Judy Lee (2012). "The Governor and the Executive Branch". In Lind, Nancy S.; Rankin, Erik (eds.). Governing Illinois: Your Connection to State and Local Government (PDF) (4th ed.). Center Publications, Center for State Policy and Leadership, University of Illinois at Springfield. pp. 77–79. ISBN 978-0-938943-28-0. Archived from the original (PDF) on 2013-06-22. 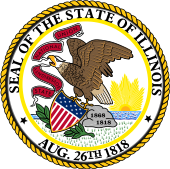 Wikimedia Commons has media related to Illinois General Assembly. This page was last edited on 28 March 2019, at 04:54 (UTC).